Charles Wilkes was an American naval officer, ship’s captain, and explorer famous for this exploring expedition to Antarctica. Portrait of Charles Wilkes. Photo credit: Shutterstock. In 1821 the attention of a fledgling United States Congress was drawn to stories of discovery, drama and derring-do in the south seas involving the lawless community of New England sealers. 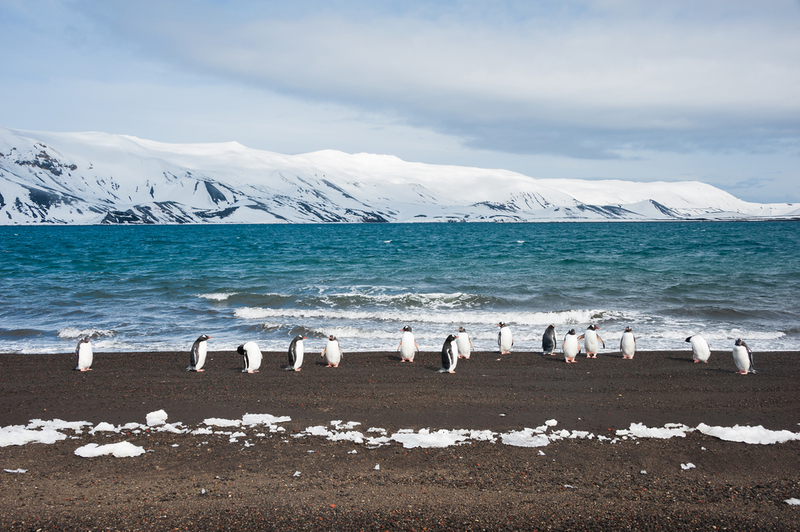 The House of Representatives debated a motion to fund a voyage of exploration to Antarctica and the Pacific Ocean, but the debate got nowhere and the idea was shelved. Eight years later there was another attempt at a government expedition and again it stalled. Tierra del Fuego, the Chilean place where Wilkes fleet arrived in 1839. Photo credit: Shutterstock. Finally, in 1836, Congress passed an act authorising a grand “United States Exploring Expedition”. 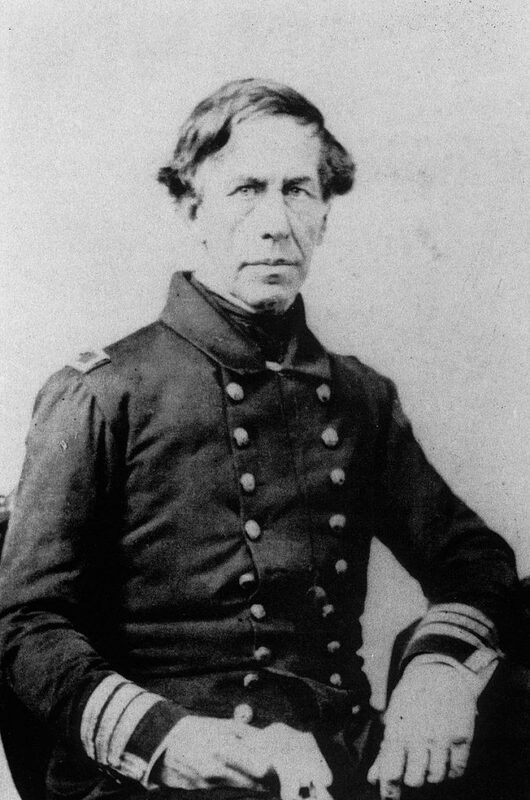 There were hiccups as ships were commissioned, built and rejected as unsuitable, until an ambitious naval lieutenant, Charles Wilkes, was given command in 1838. Wilkes proved efficient at marshalling resources, and by the late summer of 1838, after a visit by US President Martin Van Buren, six ships set off on a voyage that would last nearly four years. The expedition’s biggest ships were its flagship, the naval sloop Vincennes, and the slightly smaller Peacock. A supply ship, Relief, and three much smaller vessels – Porpoise, Sea Gull and Flying Fish – made up the fleet of six ships that sailed out of Virginia on 18 August 1838. 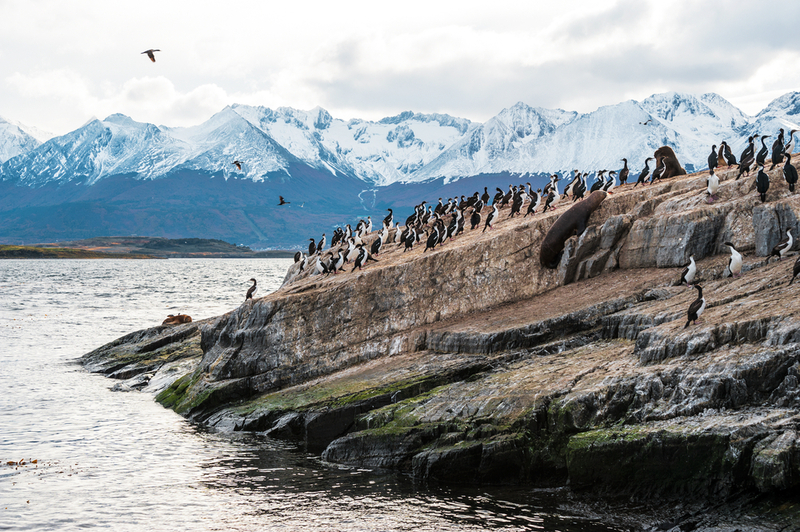 The fleet arrived at Tierra del Fuego, in the far south of South America, in March 1839. The Vincennes in Disappointment Bay, Antarctica. Photo credit: Smithsonian Institute . In the small amount of time available so late in the Antarctic summer, Porpoise and Sea Gull were sent to explore the east coast of the Antarctic Peninsula. Sea Gull sprang a leak and with the crew’s health deteriorating the ships returned to their South American base. Peacock and Flying Fish had more success exploring the Peninsula’s west coast, but were forced back by bad weather. With two of his ships, Peacock and Relief, already headed for Valparaiso, Chile, Charles Wilkes decided to assemble the full fleet there. But on the voyage north Sea Gull was lost with all hands. In his report on the voyage to date, sent from Valparaiso, Wilkes said he had decided not to continue with the cumbersome Relief. With a ship lost and another ship retired, the report didn’t go down well in Washington. 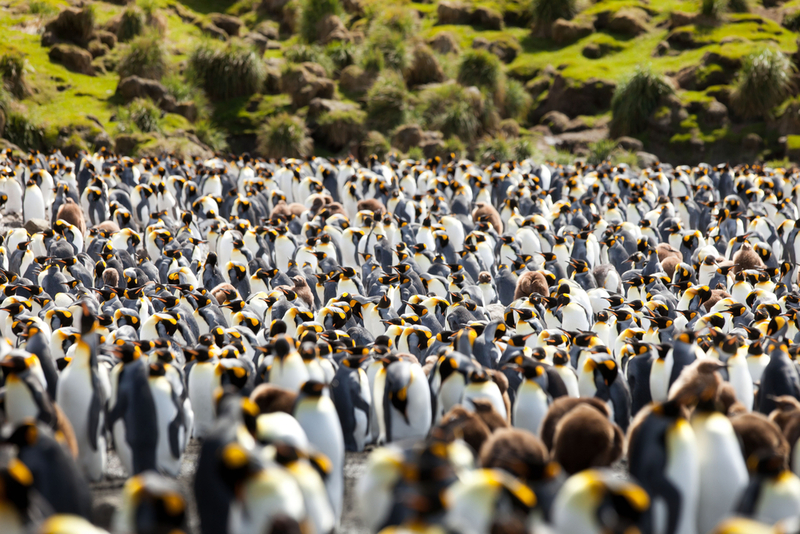 Penguins on Macquarie Island. Photo credit: Shutterstock. The four remaining ships crossed the Pacific to Sydney for a winter refit, but Wilkes’s difficulties didn’t stop there. Many crew members deserted, unhappy with conditions on board and Wilkes’s severe punishments for misdemeanours. Straight after Christmas the four ships headed for Macquarie Island. But the problems continued. Low cloud and misty rain prevented the ships from coming together at the island. Flying Fish reached the edge of the pack ice, but was leaking badly and sailed north to New Zealand. Peacock, Vincennes and Porpoise each sailed separately to the pack ice. 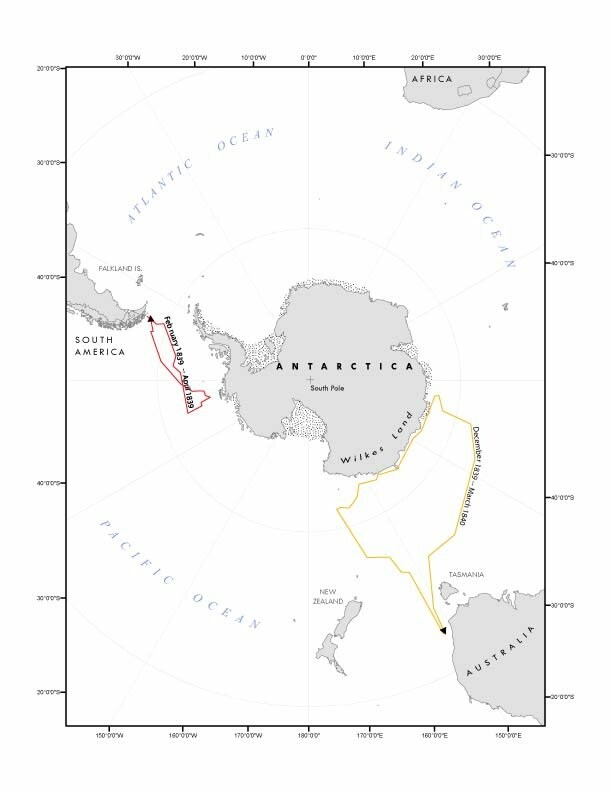 The two major voyages taken to the Antarctic under Wilkes command. Photo credit: NCSC-The Encyclopedia of Earth. Finally, fortune smiled on the depleted fleet when they sighted each other and met at the edge of the pack ice off what is now Oates Land. Charles Wilkes decided to sail his three ships westward, rather than to the east. Had he gone east the great indentation we now know as Ross Sea might well have carried his name. Early in the western voyage, Peacock returned to Sydney with rudder damage. Soon after that, Porpoise, commanded by Cadwalader Ringgold, sighted the Frenchman Dumont d’Urville’s flagship Astrolabe. The contact was also recorded by the French, but the two ships did not communicate with each other. 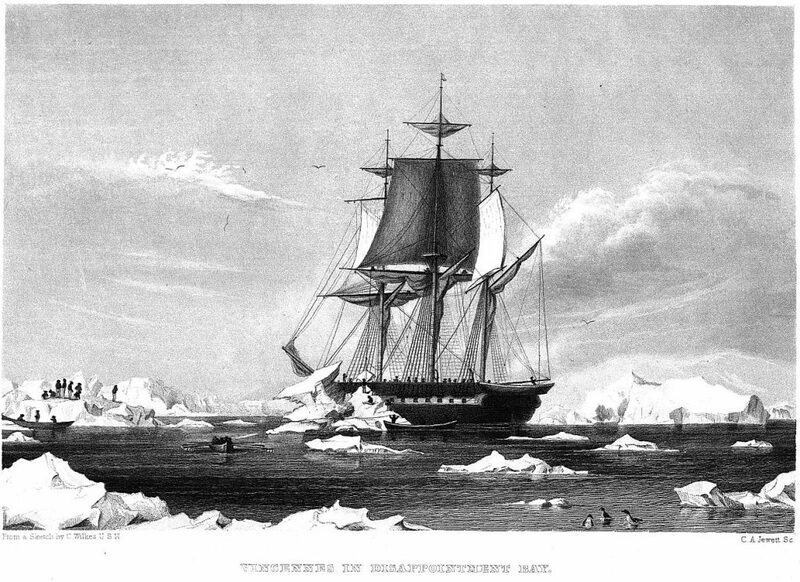 There may have been a simple explanation, such as problems with navigating in ice, but both expedition leaders later claimed to have been insulted. Another blot on Wilkes’s reputation. Porpoise returned to New Zealand soon after, but Wilkes remained off East Antarctica aboard Vincennes for another month, sailing Vincennes far to the west, to what is now Shackleton Ice Shelf (he gave it the name “Termination Land”). Visibility was often poor, but Charles Wilkes recorded what he called the “appearance of land”. His ships logs showed the fleet was close to the coast at several points, so it is not too much of a stretch to conclude that he did actually see land. But that was not enough to convince his detractors back home, and some later explorers seemed to verify these misgivings, finding that in places his charts showed land where there wasn’t any. On returning to Sydney, Wilke’s Vincennes met up again with Peacock, then the two ships made a rendezvous in New Zealand with Porpoise and Flying Fish. While in New Zealand, Wilkes sent a message to Captain James Clark Ross in Hobart Town, where the British explorer was preparing for his own voyage south. Ross already knew from Dumont D’Urville of Porpoise’s encounter with Astrolabe and this no doubt coloured his view about Wilkes’s account of his voyage. In any event, Ross’s scepticism was yet another black mark against the American. Wilkes’s four ships then completed their final assignment, to explore and chart the Pacific coast of North America, where Peacock was wrecked at the dangerous mouth of Columbia River. The remaining ships headed west across the Pacific to the British colony of Singapore, where Flying Fish was sold. Finally, in June 1842, Vincennes and Porpoise arrived to a very subdued homecoming in New York. Instead of being greeted as a national hero, Charles Wilkes was to face a naval court-martial in which he was charged with “scandalous conduct”, falsehood and exceeding punishment standards in his discipline of his crew. He was convicted on the latter charge and fined, but remained in the navy, serving with distinction on the Union side in the Civil War. He retired from active service in 1864, and had reached the rank of rear admiral when he died, aged 79, in 1877. Wilkes may have deserved the charge of unduly harsh treatment of his men, but he definitely didn’t deserve to be attacked about his expedition’s achievements. In a voyage spanning four years and over 140,000 kilometres, he explored the Antarctic continental margin for 2400 kilometres and produced over 100 exceptional nautical charts. In a letter written in March 1840 he became the first person to assert the existence of an “Antarctic continent” at the South Pole. During his lifetime Britain’s Royal Geographical Society awarded him a gold medal, but it took until 50 years after his death for his own country to acknowledge his real achievements. His name has been recognised in Wilkes Land, a 1500 kilometre stretch of the East Antarctic coast whose existence he was first to postulate. He was also acknowledged in the naming of a US base in East Antarctica in 1957. Wilkes base was later taken over by Australia before eventually being replaced by nearby Casey station. Do you want to do your own expedition to Antarctica? Chimu Adventures offers many voyages to the white continent. Click here for more information.